2 days ago all of my SMS messages disappeared. I cannot confirm if they were deleted by my clumsy hands or if there was a glitch in my phone. If anyone know of an issue with the phone opening items randomly or deleting all the message, please advise. But now….what to do…can retrieve my deleted SMS messages? I’ve searched Google Play and the Internet and have found a couple of applications that claim to be successful. It appears the phone needs to be rooted – which I hesitate to do. Can anyone confirm if SMS messages can be retrieved after deletion. I’ve new SMS messages come in, so hopefully the old messages on the phone have not been overwritten. Once you encounter this kind of incident, there are few points, to which you should attach great importance, so as to increase the possibility to regain your valuable text messages. 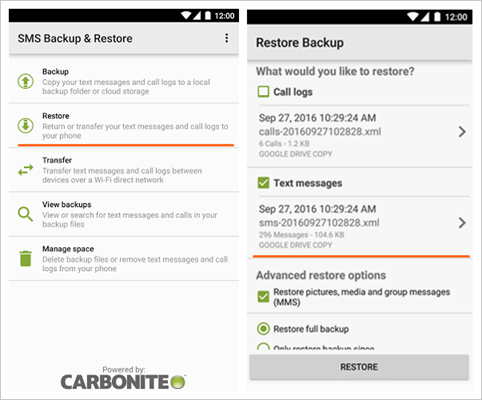 Part 2: How to use Android Data Recovery to restore SMS? 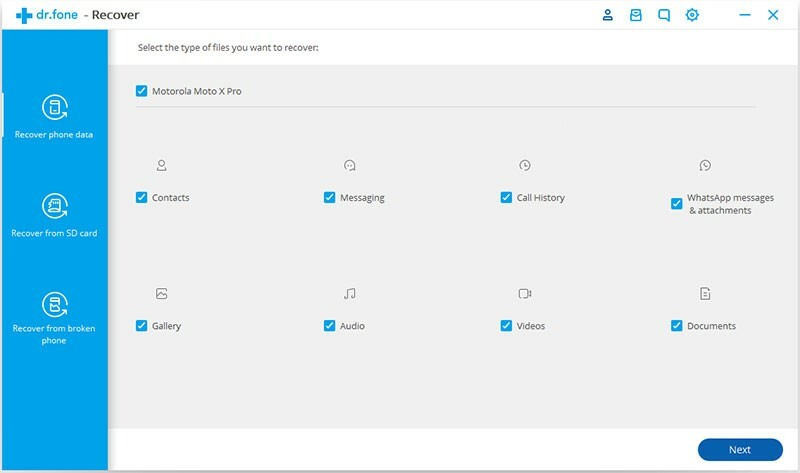 You are supposed to pay high attention to the following three steps after losing SMS, so that you are more likely to recover them from your Samsung Galaxy device. 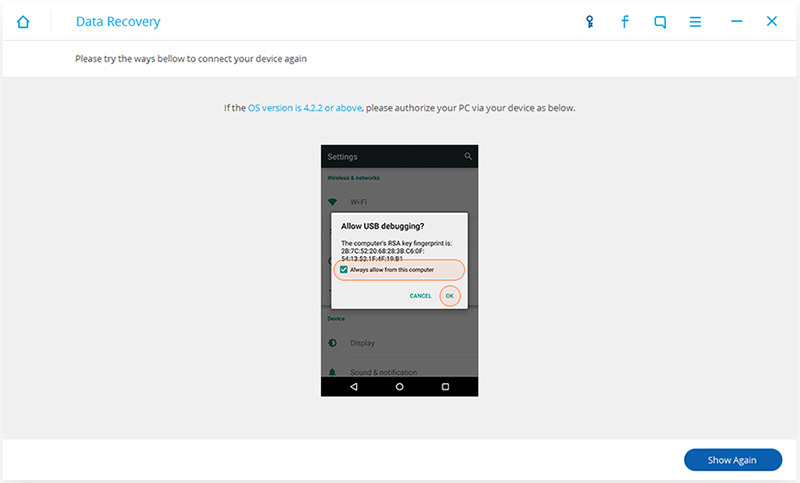 – For the purpose of avoiding data being overwritten, please don’t add or remove any messages from your device after the mistaken deletion, otherwise, you are never able to get them back. – Do not use your Samsung phone until the deleted texts are retrieved. – The earlier the SMS is restored, the more likely for you to achieve the recovery and less possible to be overwritten. After these immediate handling, the next step you should do is to recover them by all means, among which the most recommendable one should be Android Data Recovery. It can be sure that you would not be regretful about using this effective and impressive data recover software! How to use Android Data Recovery to restore SMS? Suppose the deleted text messages fortunately haven’t been overwrote in your Samsung Galaxy S8/S7/S6, Samsung Galaxy Note 7/Note 5/Note 4, the sooner you take actions to get them back the better, but how? If you have no idea, just try the following method. Step 1. 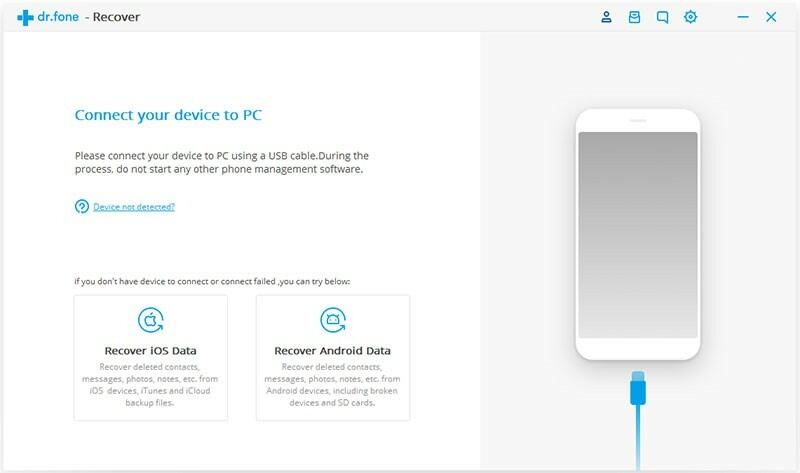 Install and open the tool Android Data Recovery and click on “Recover” option from dashboard, then plug your Samsung device into computer. Step 2. There may pop up a window, in which you are required to allow USB debugging, just click on “OK” to move on. 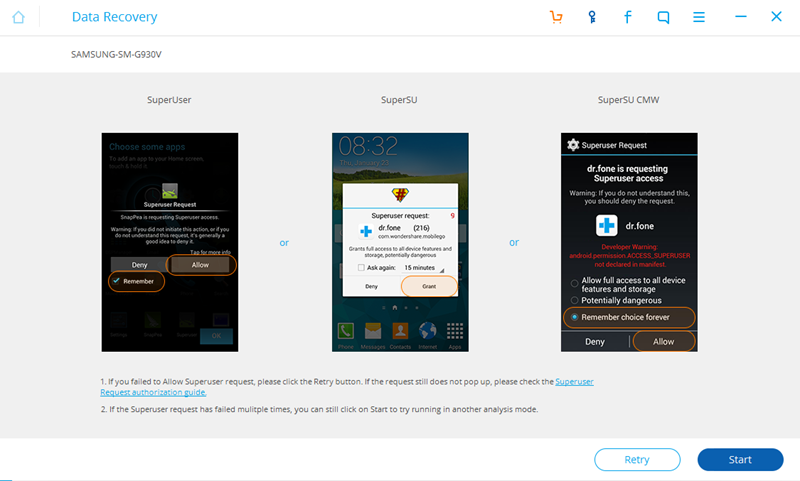 Note: There might be a Superuser authorization pop up on your device during the scan. If you get it, click “Allow” to continue. If not, just skip this step. Step 3. Based on the volition of your own, you can select the type of file that you want. In this case, you need to regain deleted messages, so just tick the little box of “Messaging”, then click on the “Next” button. Step 4. There are two types of scanning mode that you are to select, each of which has its own advantages and disadvantages, so please read the listed warnings carefully and choose one. Click the “Start” button and begin to scan your phone. Step 5. Wait until the scanning process is over, do previewing before tapping on “Recover” and save the retrieved messages on your PC. 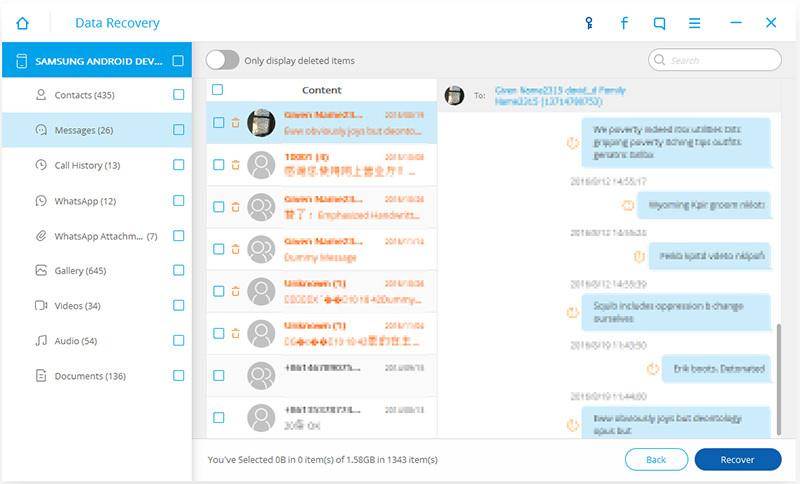 The retrieved messages will save as TXT document, HTML document and XML document. Step 6: You can view your messages in TXT document or HTML document on the computer. 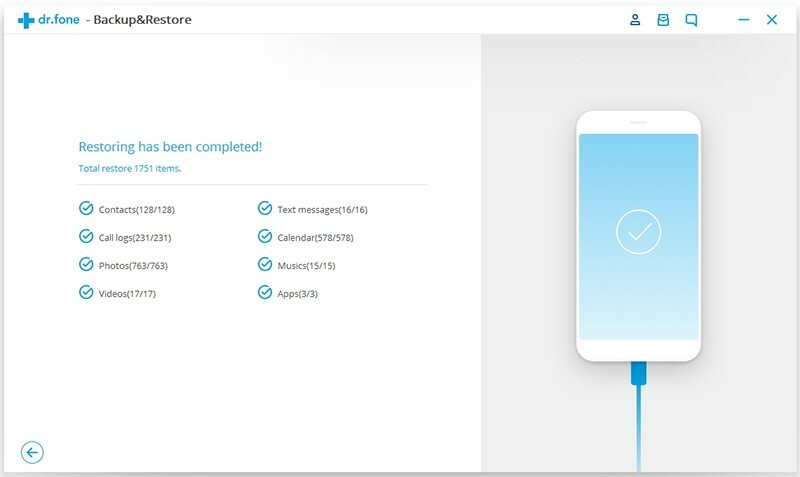 Launch the APP, tap on “Restore” and select the local SMS backup file (XML file) you want to restore. Step 1: Start the program, choose “Backup & Restore” among all the toolkits and use USB cable to do Samsung-PC connecting. Step 2: Tick on “Messaging” among all the selective file types or you can select all, which will take a relatively longer time. Click on “Backup” to continue. 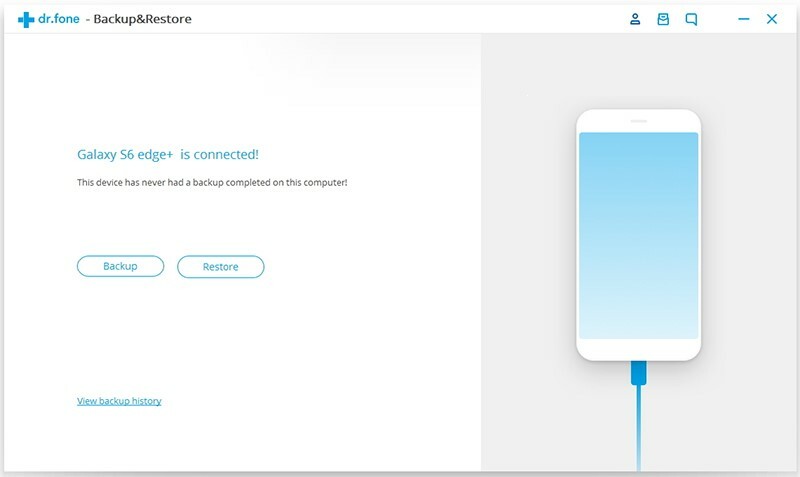 Note: Please don’t disconnect your Samsung Galaxy, don’t use the device or delete any data on the phone during the backup process. 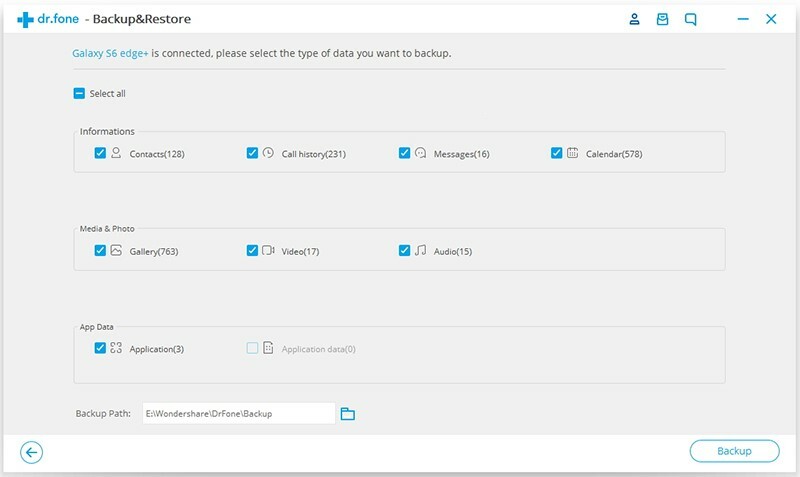 Step 3: When “Backup has been completed” is displayed on the prompt, click on “View the backup” to see what have been stored. Done. Hope that the measure and advice mentioned above would be helpful for you and any annoying trouble of losing messages or other important data will never happen again, which surely needs your own attention and concern.